It was one of those memorable meals. We were at the tail end of a summer trip through the maritime provinces of Canada, staying at the historic St Andrews Hotel in New Brunswick, just a stone’s throw from the bay of Fundy that boasts the highest tides in the word. The waiter was describing one of the most delicious sounding beef short ribs ever. 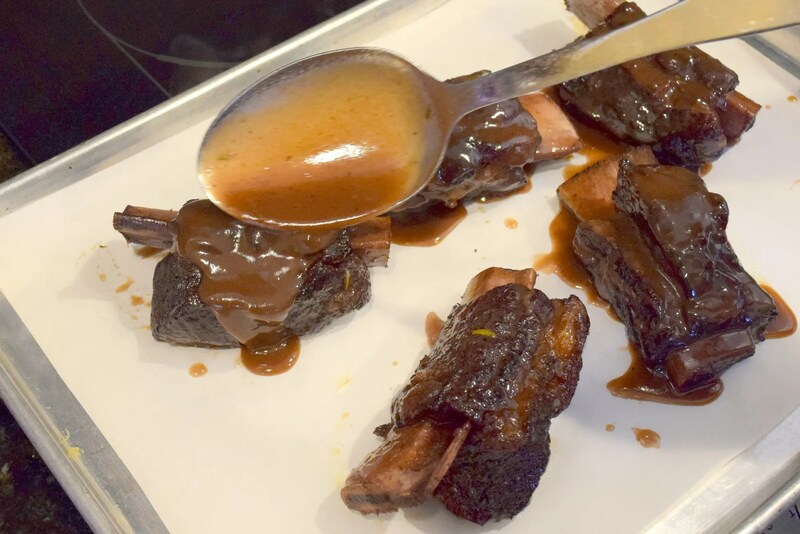 Slow braised premium beef short ribs, finished with a rich Canadian maple syrup glaze. I was hooked. Didn’t even have to look at the menu, I knew what I was having. My Mom decided she would have the same thing. Not because she thought it sounded so fabulous but because there was a lot of seafood on the menu and she doesn’t like seafood. The wrench in my plan occurred when the apologetic server returned to say there was just one order of the ribs left. Drat. The problem is, I’m a good girl, I let my mom have the ribs. I am not sure what I had, it could have been a toad sandwich on stale bread. I just don’t remember. My eye was on the ribs that got away. In the years since, I have tried recreating those ribs many times, but I just couldn’t get it right. It wasn’t until our trip to Gordon Ramsay’s Steak just this past summer, I realized what I might be doing wrong. I was using tomatoes in the braising liquid and Gordon uses wine; maybe the wine was the difference? Fast forward to a few weeks later when some good friends arrived for dinner at my house with a bottle of red and a bottle of white wine. What was I to do with a leftover half-bottle of red wine? Make braised ribs of course! The result was amazing. Tender, flavorful, melt in your mouth ribs with a rich sticky maple glaze. Oh my! Start by making sure the ribs are dry, wet beef doesn’t brown well. Liberally salt and pepper all sides of the ribs. Try and find the meatiest ribs you can find. 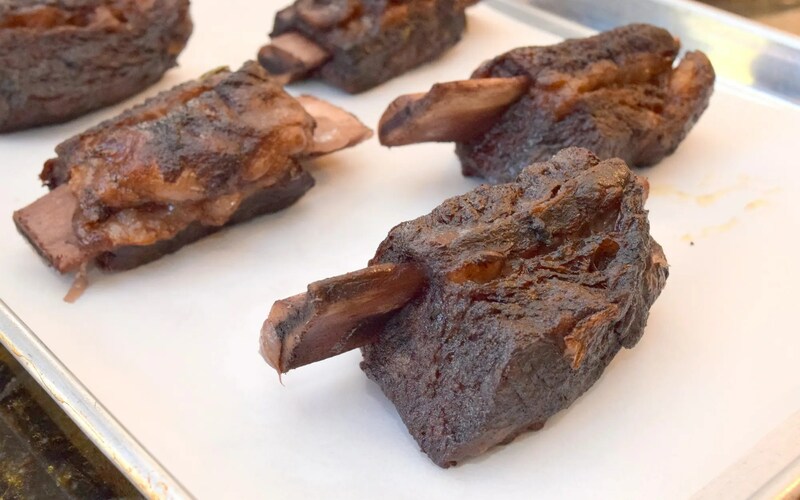 Short ribs are fatty, that’s where the flavor lives, but sometimes they can be too fatty. The local butcher told me this particular cut of ribs is called “english style”. Next, place a dutch oven on the stove and heat with medium heat. Add two tablespoons of oil. I’ve been using grape seed oil lately, it’s light and doesn’t burn easily. The key to a good sear is making sure your pan is hot enough, add a drop of water, if you want to make sure. If it sizzles right away, you’re ready to go. You’ll want to get a nice brown color on all sides of the ribs. Don’t crowd the pan, or the meat won’t brown. Do a few ribs at a time if necessary. 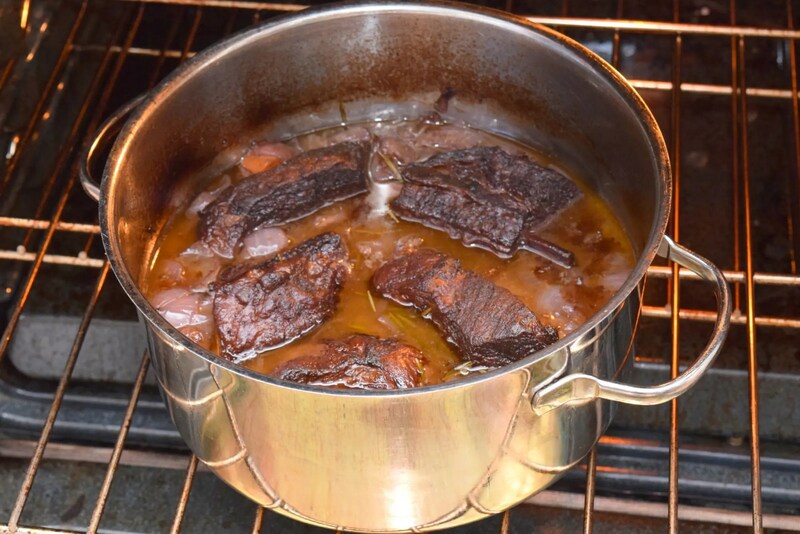 After the ribs are browned, remove from pot. Also remove all the fat except about a tablespoon. Leave the browned bits at the bottom of the pan. That’s the flavor baby! 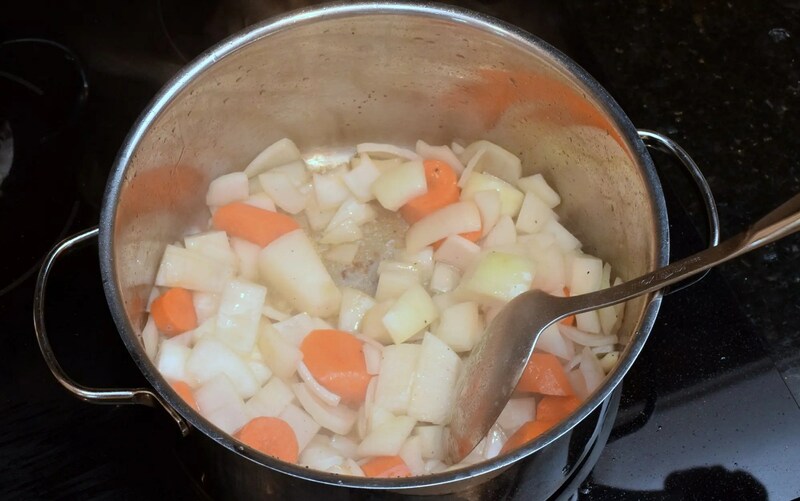 Add in the coarsely chopped onion and carrots and cook 3-4 minutes until onions start to soften. They will also start to smell really good! Next add in the wine and beef broth. I always use the low sodium broth so I have better control of the salt in my food. If you use too many items with salt already in it, it’s easy to over salt your dishes. 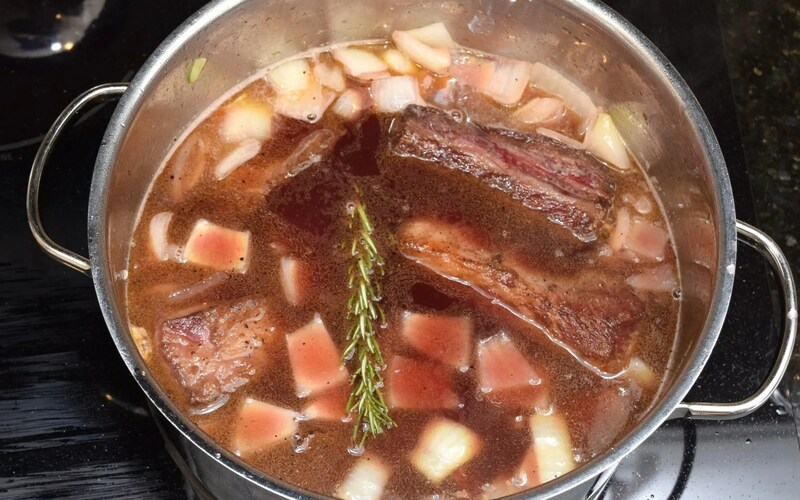 Add the beef ribs back into the pot and add in the sprig of rosemary. Cover and place in the oven. Cook covered in the oven for about 45 minutes, turn the ribs then replace cover and cook about 45 minutes longer or until fork tender. I need to put cleaning my oven on my to do list pronto! When finished cooking, remove ribs from braising liquid and place on a parchment covered baking sheet and set aside. Next strain the veggies out of the braising liquid. Skim as much of the fat off the liquid as you can. This works best if you can cool the liquid or if you have a fat separator. 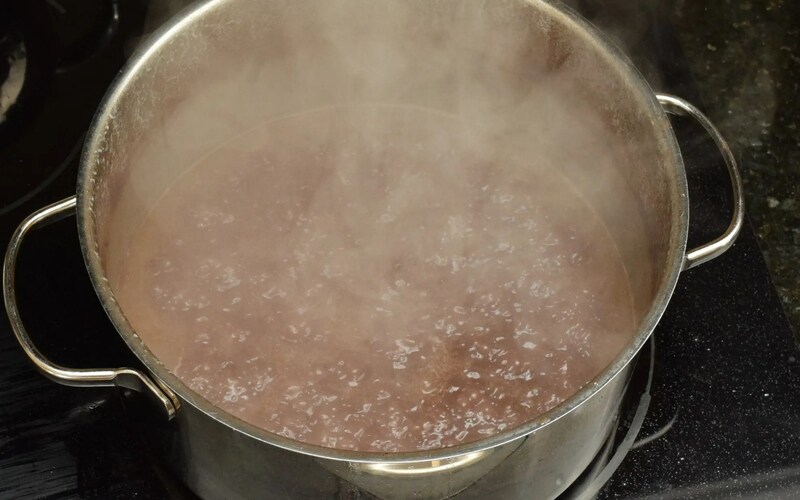 The return liquid to the pot and simmer over medium heat until liquid is reduced by half. In the meantime take about cup of the onions that were in the braising liquid and puree in a blender until smooth. 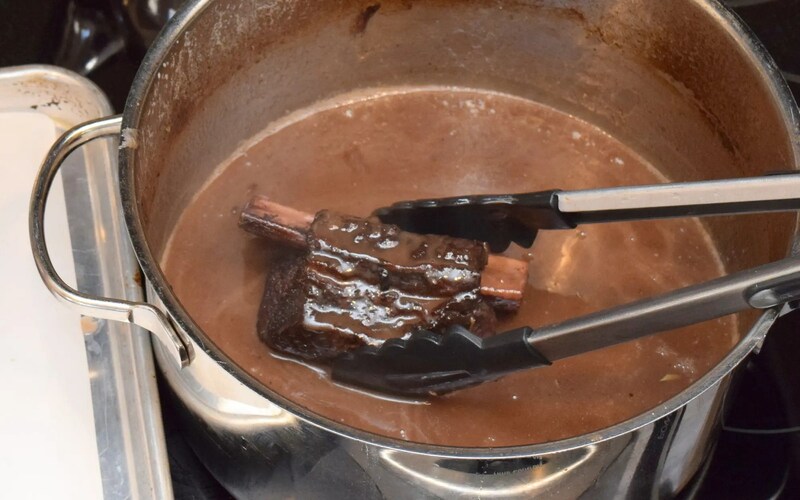 Use a small amount of the braising liquid if necessary. The pureed onions will add flavor and will help to thicken the sauce without any flour or cornstarch. When the braising liquid is reduced by half add in the pureed onions. I usually add in half a cup, stir and taste and then add the rest of the onions if necessary. Then add in the maple syrup and sriracha a tablespoon at a time so you can season to your family’s taste.. The sriracha adds another layer of flavor without being super hot. If you like spicy food add more! 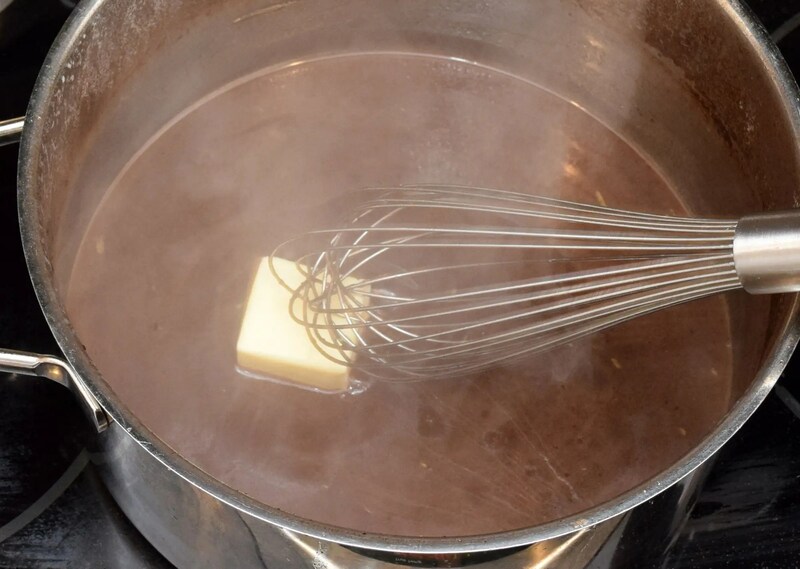 Remove the liquid from the heat and finish the glaze with a tablespoon or two of butter. This will emulsify the sauce as well as ensure that your glaze will have a nice shine to it. Again taste the sauce. Add more seasonings if nessary. Next, coat the short ribs on all sides with the glaze. 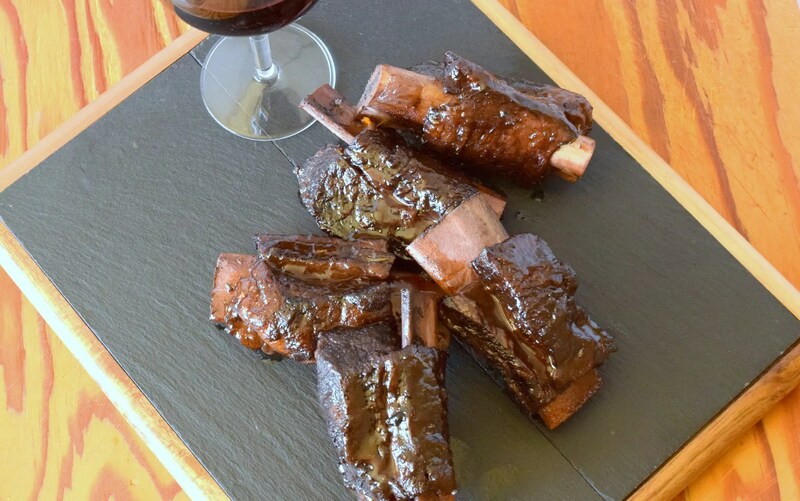 Delicious braised short ribs are finished with a rich maple glaze. Pat the ribs so they are dry, then liberally apply salt and pepper. Heat a large dutch oven on the stove and add 2 tablespoons cooking oil. In batches, sear or brown all sides of the ribs until they are well browned. Transfer ribs to plate. 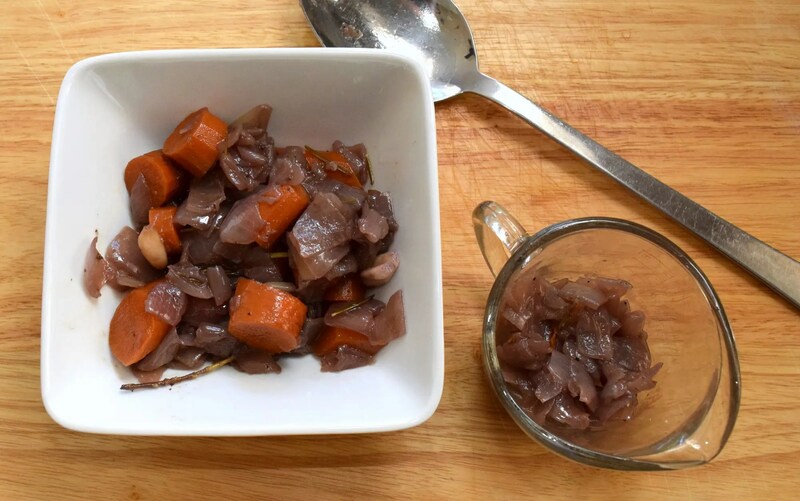 Remove all but one tablespoon of oil from pot and add the coarsely chopped onions and carrots. Saute for three or four minutes until onions begin to soften. 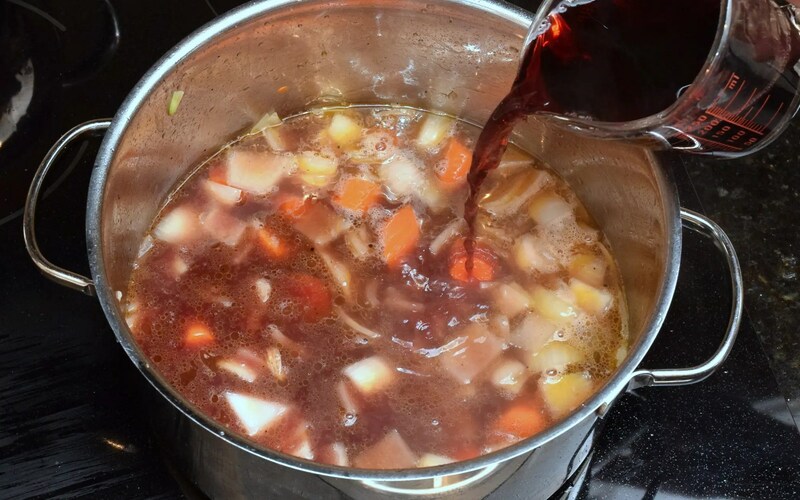 Then add wine and beef broth. Add the ribs to the mixture and top with the sprig of rosemary. Cover pan and place in oven. After 45 minutes turn ribs, then cook for another 45 minutes. When finished ribs should feel very tender when pierced with a fork. Remove from cooking liquid and set aside. Strain braising liquid to remove veggies. 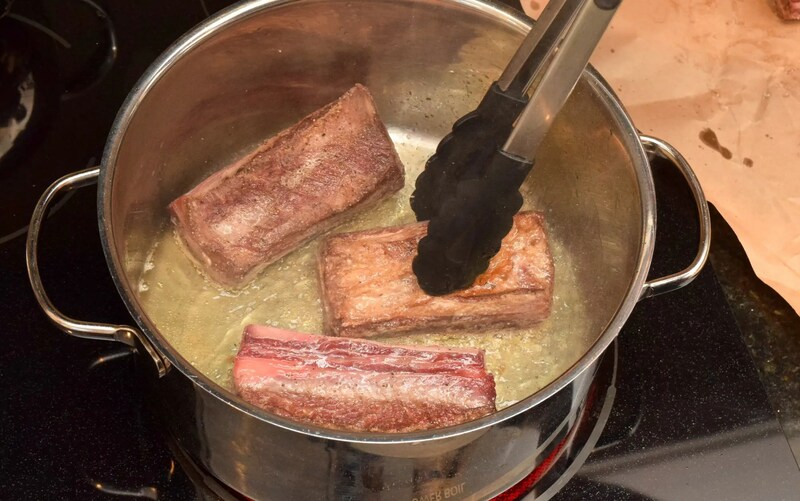 At this point you will want to skim the fat off the braising liquid, if you have time cool the liquid it will be easier or use a fat separator if you have one. Return pot with braising liquid to the stove top and on medium heat simmer liquid until reduced by half. 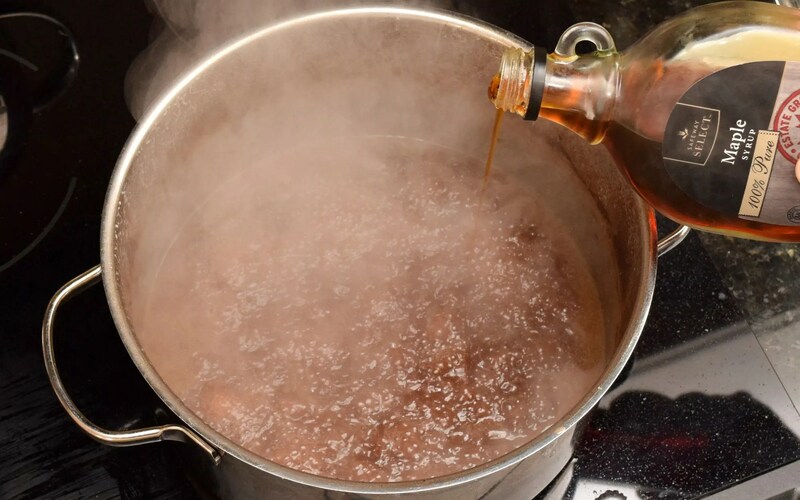 Meanwhile take 1/2 to 1 cup of the cooked onions and puree in a blender (use a little of the braising liquid if needed) When braising liquid is reduced by half and has thickened, add the pureed onions. Taste the sauce after you've mixed in about half the onion and see if it needs more and add more accordingly. Stir in maple syrup. Add one tablespoon of the sriracha, taste, then see if you want to add the second tablespoon. When sauce is seasoned to your liking, remove from heat and stir in the butter to finish. Add the ribs back to the pot to coat all sides with the glaze, then transfter to a baking sheet. Spoon more of the glaze on top of the ribs. Roast in a 400 degree oven about 15 minutes or until glaze has caramelized on the ribs. Remove from oven and serve. These look awesome! 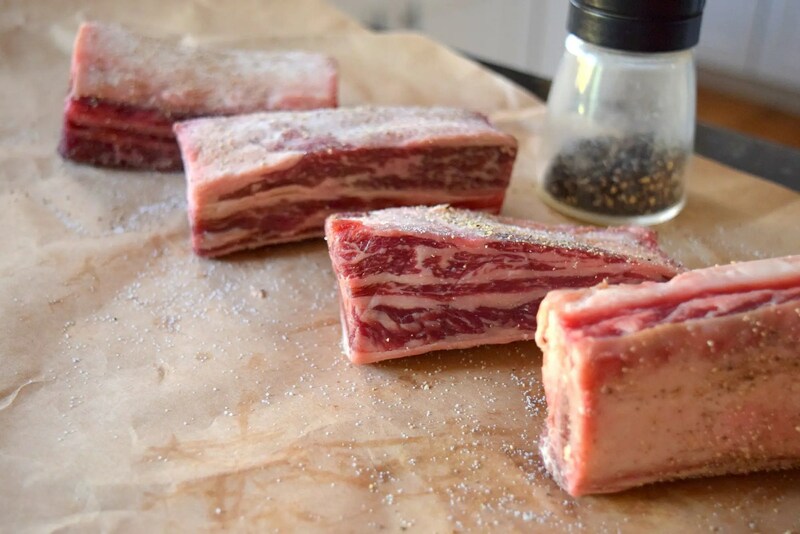 I get grass fed organic beef ribs on the cheap at a local grocery store, I’m going by to pick some up pronto! That’s funny you mention grass fed and organic, that’s exactly what I used. I don’t think I have a sophsticated pallet but I swear I can tell the difference between grass fed and corn fed beef.